What’s your favorite brunch cocktail? Perhaps a Bloody Mary? Or maybe Mimosas? 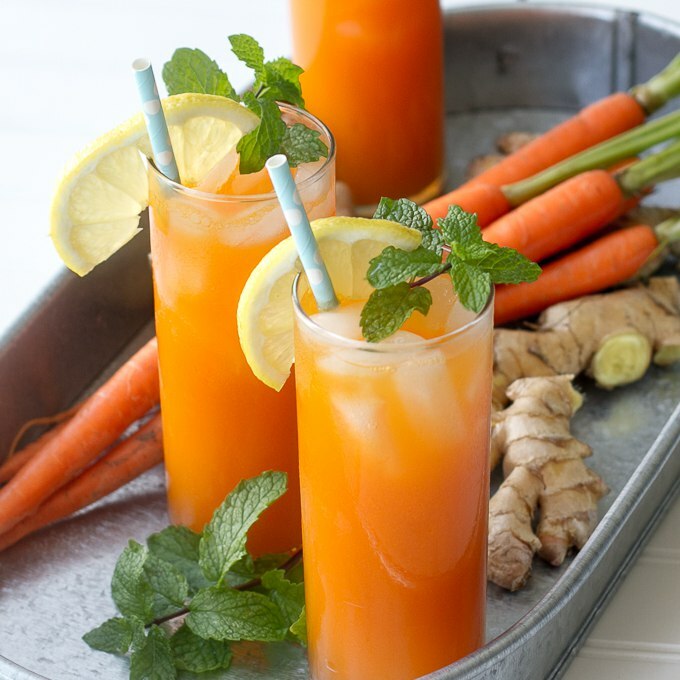 I have a new one for you to try… a Ginger Mint Carrot Cooler. Ok, I know what you might be thinking “why on earth would I want a cocktail with carrot juice in it?” Am I right? Don’t click away, stay with me, I promise you’ll really like this drink. Really, I PROMISE! It makes a fantastic brunch cocktail and you don’t have to put alcohol in it if you don’t want to. At first I thought carrot juice might be weird in a cocktail. But I had a big bottle of it staring at me in the refrigerator and thought what the heck, might as well give it a try. After all, I like tomato juice in Bloody Marys and that’s made with a vegetable juice. I love carrot juice in my smoothies so how bad could it be with a little vodka (or rum) added in? See, now it’s sounding better isn’t it? I told you to stay with me! Ginger compliments carrots nicely so I muddled some fresh ginger, tossed in a bit of ginger liqueur and topped it off with ginger beer for some fizz action (you could use ginger ale instead if you wanted). I wanted to “lighten” up the carrot juice so this drink wasn’t too “carrot-y” and used some fresh squeezed lemon juice and a little mint for freshness. And, of course, a little simple syrup to balance it all out. I used the same mint simple syrup I used in my yummy Orange Mint Juleps but you could certainly use plain simple syrup. Simple syrup in cocktails to me is like salt & pepper on food…you don’t need a lot, but a little pulls it all together in my opinion. 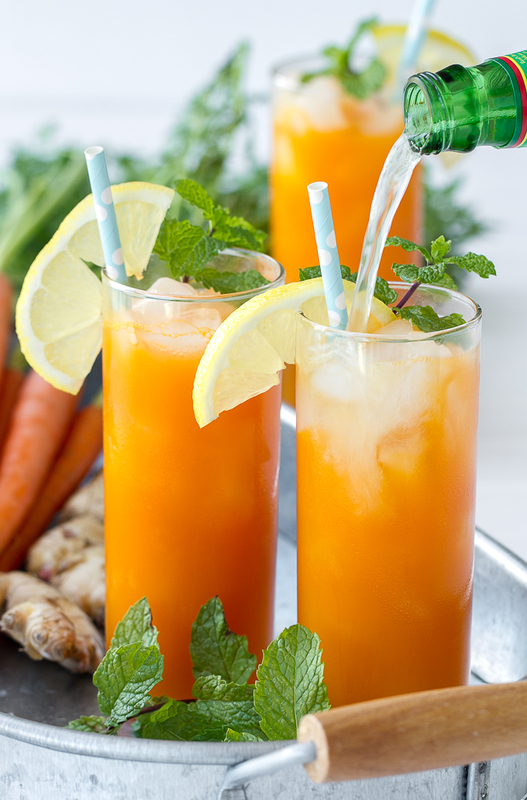 This Ginger Mint Carrot Cooler might just replace your Bloody Mary at brunch next time. So while you’re at the market, grab some fresh carrot juice and fix yourself one of these babies. Heck, you can almost convince yourself you’re drinking something healthy and good for you! Move over Mary, here comes Ginger! In cocktail shaker, muddle mint leaves and ginger. Add some ice to the shaker and add the carrot juice, vodka, ginger liqueur, simple syrup and lemon juice. Shake well, strain into tall glass filled with ice (fill about ⅔ full). Top off with ginger beer or ginger ale. If you make these Ginger Mint Carrot Coolers, be sure to grab your phone and snap a pic. Tag @imboredletsgo on Instagram so I can like and comment on your photos! Okay I trust you, but…really? You need to come to San Diego to make this so I can do a test run. How healthy and refreshing.. the perfect summer cooler! I love ginger, carrot and mint together so I definitely need to make this recipe. I am certain I would love this! Hey Judy, its great blog and i love the carrot juice and you make a healthy juice with mixture of ginger and mint its yummy. Thanks for sharing it with us. Well now this is a way to get your vitamin A 🙂 So I don’t think carrot juice in a cocktail is at all weird! I can’t wait to try this! As a fellow carrot drink maker (http://www.dirtylaundrykitchen.com/hair-of-the-dog-breakfast-margarita/) I know I’ll like this. Glad to see I’m not the only “crazy” one out there. Your margarita sounds awesome. I’m going to have to try that one! This looks insanely good-perfect for holiday weekend brunch! Thanks for sharing!